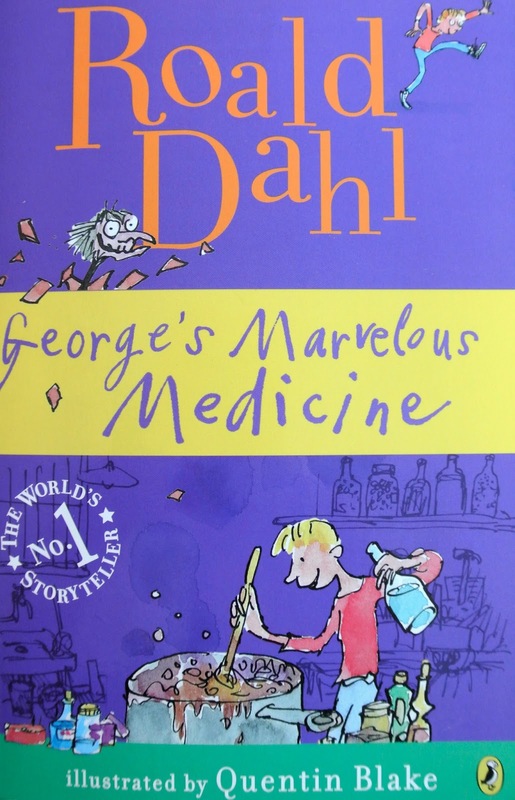 We’re back to reading one of our favorite authors this week: George’s Marvelous Medicine by Roald Dahl. Little 8 year old George is left at home one afternoon to take care of his mean, creepy old grandma. When she gets especially obnoxious, George decides to cook up some special medicine to get her back. After tossing in just about everything he can find from the bathroom, laundry, barn and garage into one big pot, George manages to brew up a magical medicine that brings on some surprising results. This is a quick, fun read. I’m reminded of some of the “potions” my brother and I used to put together as kids – although we never thought to actually feed our brews to anyone. Wonder if I should give my boys permission to create a few concoctions themselves? And then I wonder if I’d dare to taste it? What do you when winter starts wearing you down? When you’ve been running about in wet wintry sleet, rain and wind all day? When your nose, fingers and toes can’t seem to warm up and you can feel the cold seeping in through the all the windows? That’s when I make myself a hot cup of tea, crawl under a pile of blankets and knit. I was really cold last week…. which resulted in a string of knitting type evenings and two new winter hats. Decided to use my Patons Wool Roving yarn to make hats for my kids. When I finished, Simon tried his green hat on, laughed at his refection and then flat refused to wear it. I ended up claiming it for myself. Luckily for me, Ethan proudly wears anything I make. I followed the “Mika” pattern from Hip Knit Hats by Cathy Carron. 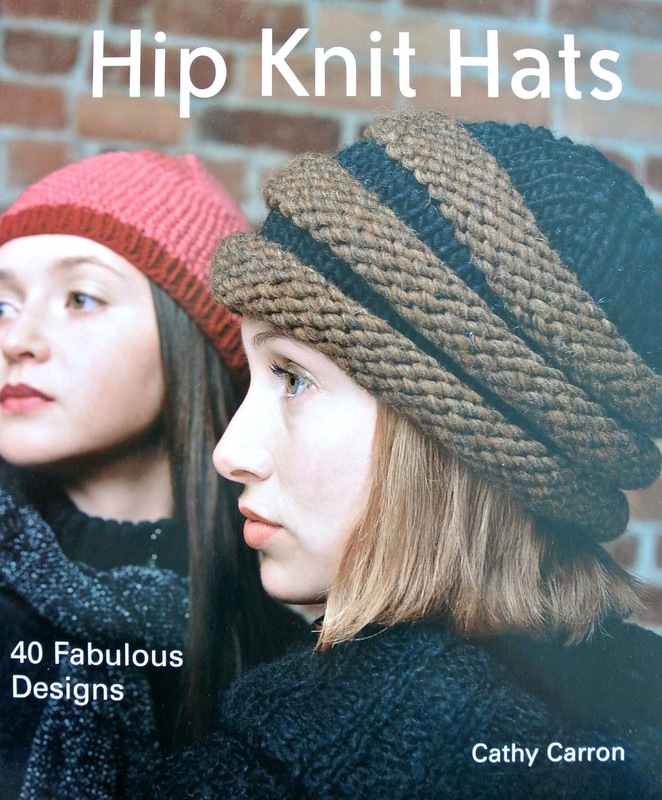 This book has quite a few interesting hat patterns. Since I like to chat, watch TV or day dream as I knit, I chose this simple pattern with a knit 2 purl 2 rhythm that’s easy for the hands to do while the mind wanders. I knit the green hat first. I was worried it wouldn’t be stretchy enough so I cast on 60 stitches instead of the 52 called for in the pattern. I ended up with a really loose hat. Probably should have taken it apart and knit it again narrower and longer, but I wasn’t in the mood to redo my work. I finished it by sewing in a plain fleece hat and topping it off with a fuzzy blue pom-pom. With both the wool yarn and the fleece lining, this is now my warmest winter hat. It may be too goofy and loud for Simon’s taste, but it’s perfect to keep me warm when playing around our neighborhood. For Ethan’s hat, I cast on 56 stitches and also knitted an extra two inches before starting to decrease to shape the crown. I wanted it slightly more narrow than the green hat, but still roomy enough to accommodate the fleece lining. Ethan decided against a pom-pom for his hat. I thought just using the solid blue too plain. So we compromised by choosing a contrast color for the top of his hat. And that’s how I battled my freezing winter blues last week. Snuggled under a bunch of blankets, working with cheerful, bright, wooly yarns, making hats to keep us warm in the present… and dreaming of the spring weather that can’t get here fast enough! Here’s a thing about living in Manhattan – I’m always schlepping a ton of things around as I walk from one destination to another around the city. Gym clothes. Groceries. Compost (I dump bags of it at Union Square every week). Purchases. Returns. Sewing box and fabric. Everything, really. You name it, I’m hauling it at some point in the week. All that stuff I’m dragging around gets real heavy. Not to mention awkward if I end up with multiple bags. 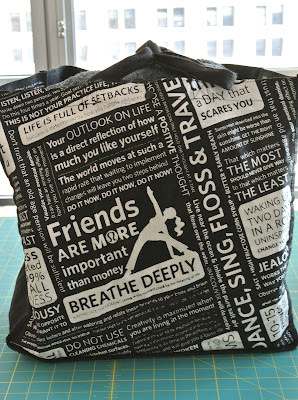 I am taking sewing lessons… I could make my own tote bag… duh! I drew up my list of must haves and discussed it with my awesome sewing instructor, Nasya (from The Sewing Studio). Rich grey color. In wool felt or suiting material? Big and strong enough to hold a weighty sewing box and a selection of fabric (that’s the bulkiest set of stuff I need to travel around with at one time each week). The bag itself would have to be light weight. 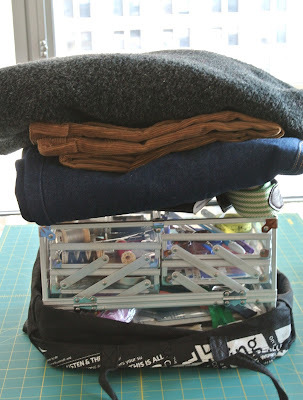 Flexibility to either attach handles the standard tote bag way to be carried on my shoulder or across the bag opening to be carried on the crook of my arm like a picnic basket. Nasya and I talked about my options for making my bag. We decided to use wool felt for the body of the bag. Swivel snap clasps & gromets for the handles & how to attach them to the bag. 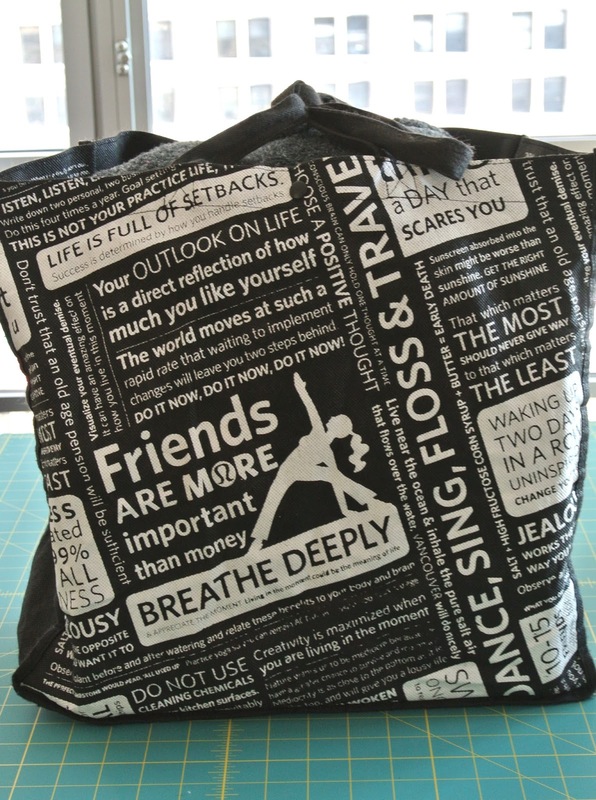 We measured out my beat up old Lululemon shopping bag, added some margin to it and decided my finished tote would measure 16 inches wide by 18 inches high and 7 inches deep. 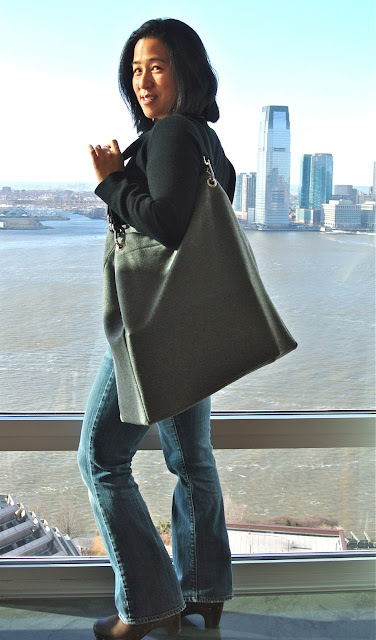 Finally, we measured out, cut and sewed my dream giant tote bag. 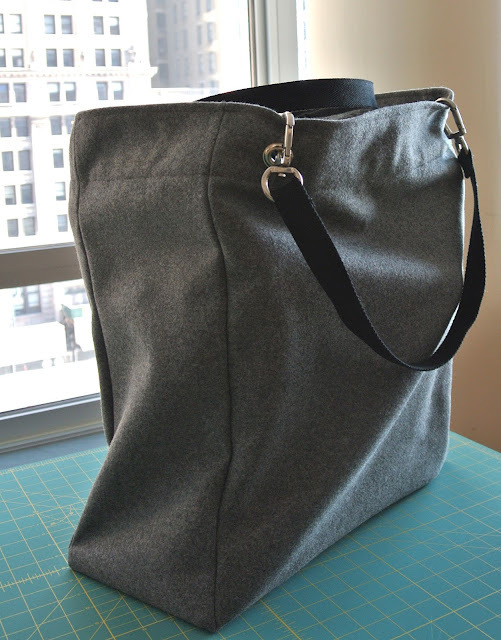 Here’s a question… could I have made this tote without all the sewing lessons? Well… I most definitely could have put something together. But it wouldn’t have been nearly as good. Yes, I could figure out how to cut out the right dimensions. I could have sewn on simple handles, but I wouldn’t have been bold enough to work with the hardware we used. Nor would I have attempted a zippered pocket on my own. Nothing would have been as neat or as precise. Having someone who knew what she was doing guiding me through the details made all the difference between hacker job and a product that… dare I say… looks store bought?! One of my favorite childhood books was A Little Princess by Frances Hodgson Burnett. I discovered the story when I was nine years old. My dad was taking a one year sabbatical from teaching. We spent half that year living in a rented home in Washington. My room was a tiny wood paneled boxlike space under the stairs. Instead of a door, a curtain separated me from the TV room. I thought it was quite a novelty. There was just enough space for a twin bed, a night stand and a built in shelf and desk. Very cozy. And best of all, the owner of that bedroom had left an entire shelf of books behind. Can’t remember all the book titles. But I do know that is where I found a battered copy of A Little Princess. That’s the first time I read this beautiful story. I’ve reread it numerous times over the years. I like to gift it to little girls whenever the opportunity presents as well. And now, this week, I’m reading it aloud to my boys. I wasn’t sure how they’d react to this story. Not because the main character is a girl (Simon will be the first to tell you that’s not a problem for him). But because, in the past, we’ve tried unsuccessfully to make it through Burnett’s other two books: The Secret Garden and Little Lord Fauntleroy. Perhaps they were just too young the last time we tried reading her work aloud. Perhaps the vocabulary was too sophisticated and the content too foreign from their everyday experiences. Whatever it was, they tried their best to listen, but we never finished either of the other two books. My desire to share this beloved story won out over any hesitations. I told them it was my turn to pick the next read aloud book and whipped out an old copy of A Little Princess. They are completely captivated by this story. We’ve been reading a good 45 minutes a day this week because they keep begging for “just one more chapter.” They’ve been coming back to me periodically to try to map out how they think the story will end. They’re wishing Sara isn’t really an orphan and that the rotten Miss Minchin gets her comeuppance. We should finish in the next day or two. Think I’m both happy and sad about it. Sad, because it’s always hard for me to come to the end of any story I love. Happy, because my kids know this story now… Know it. Love it. And plan to reread it for themselves next. Do you like chicken wings? I do. In fact, I can eat the stuff by the bucket. Let me clarify. I like chicken wings – especially fried wings. I generally don’t like baked chicken. But when my friend, Anita, announced she was baking up a giant batch of outrageously tasty wings for our school’s winter carnival, my curiosity was piqued. I asked for the recipe & tried it out on my family. It was a huge hit. These “Little Chickens” are seriously tasty. And the preparation simple. I made two pans of wings and we took it down in just 2 meals. Yum! Are you inspired to bake up a pan of these for yourself yet? This recipe was created by Anita’s friend’s mom. Thank You Jean for sharing this rockin’ dish! Bake for 1.5 hours. Flip the wings every 20-25 minutes. You know the wings are done when the smell coming out of your oven is so tantalizing you just have to pull a wing out & eat it. Remember my troublesome non-butter eating spouse? Well, I didn’t want to hear him complain about the smell of butter and I actually wanted him to eat with us. So I substituted olive oil for the butter. I also added a splash of Mirin in for a slightly sweeter taste. Anita sometimes makes her wings with equal parts scotch & honey. No garlic. Soy sauce optional. I’ve never tried scotch…. but I bet I’d like it baked in with the honey. A big Thank You to Anita too – having friends to bounce ideas around & to share recipes & craft projects with makes every day that much better. If anyone else comes up with another variation for this dish, please write in & share with us!